Maxi Ginkgo Biloba 10000mg is a brain tonic and has been shown to be an effective herb to improve short term memory and mental alertness. 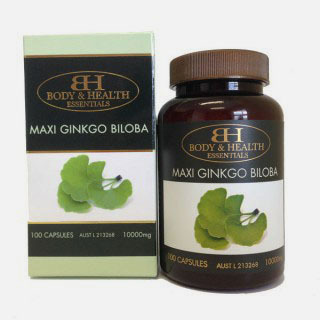 Ginkgo extract aids blood circulation and protects the capillaries. Ginkgo also has protective antioxidant effects and supports peripheral circulation, assisting the healthy function of the cardiovascular system. Adults – Take 1 capsule a day, or as recommended by a healthcare professional. Assists with the maintenance of general health and well-being.